Dani has been cranking out these handsome felted tweed hats. 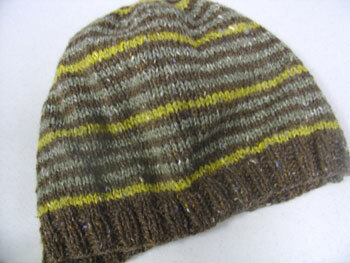 The pattern is the striped beanie from Knitting for Him: 27 Classic Projects to Keep Him Warm . Love that punch of color with the green! Dani's been working on another patchwork blanket (she made this same pattern from Baby Knits for Beginners a couple of years ago). This is in gorgeous shades from greens to orange and red. 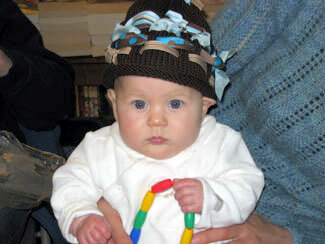 She's planning on making a matching striped elephante toy to go with it. Awwww. 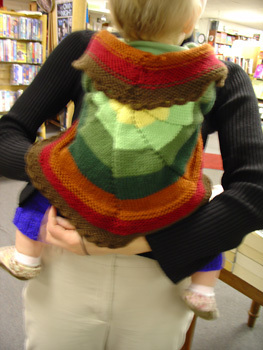 Dani just finished a beautiful baby pinwheel sweater in the loveliest fall colors of Knitpicks Swish. 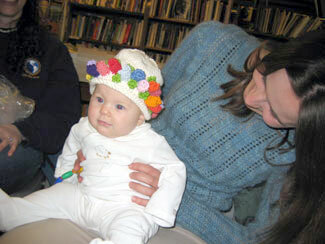 And baby Kaya was nice enough to model it for us! 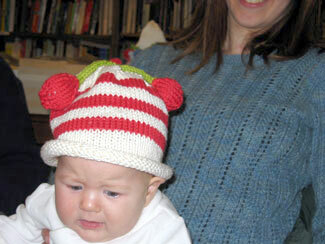 Last week, Dani was working on this adorable baby sweater, Geordie from Natural Knits for Babies and Moms. 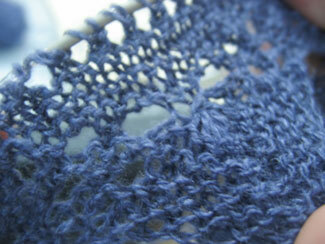 She's all done with it now - check it out on her blog. Dani is back from her wedding! 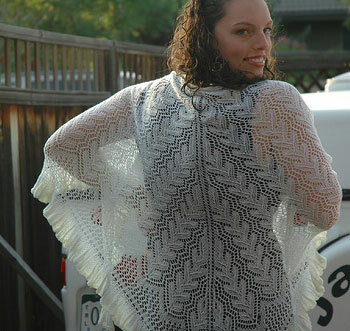 She looked gorgeous in the stunning wedding shawl she knitted for the occassion. Congrats, Dani! 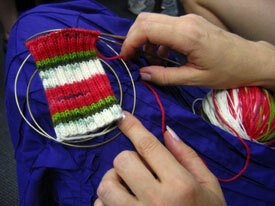 Both Dani and Dana are working on monkey socks (and both in Dani's fabulous yarns!). 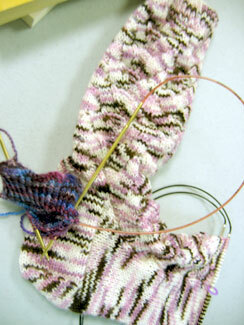 Dani's almost finished her first "neapolitan" monkey (yum!) and Dana is just getting started with her "not dana" monkeys. 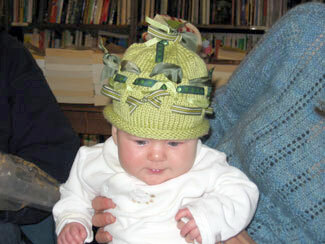 The rosebud hat. Pretty, pretty. The bunny hat. Oooh, cute! 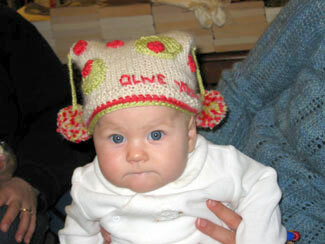 The cherry-o hat. Love those cherries! 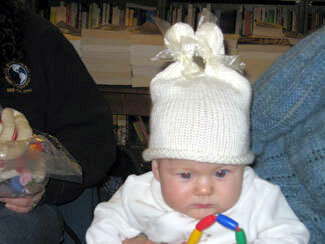 Another ribbon hat. Double awwwww. Thanks Dani for sharing all the hats! And thanks Johanna for the super model! 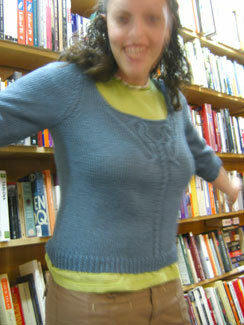 Dani finished her Lucy in the Sky cardigan. 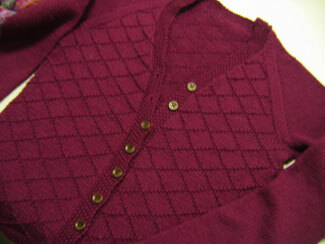 It came out awesome in that rich burgundy Cashmerino Aran! 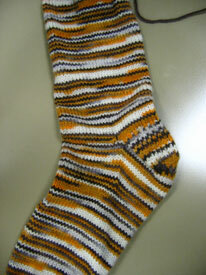 See more finished pics of it on her blog. 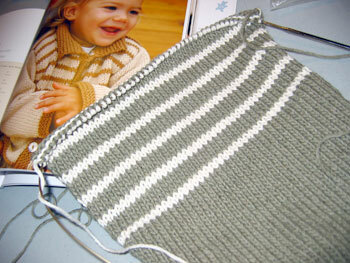 Back in September, Dani was working on the cutest Sirdar baby sweater in Rowan Cashsoft DK. 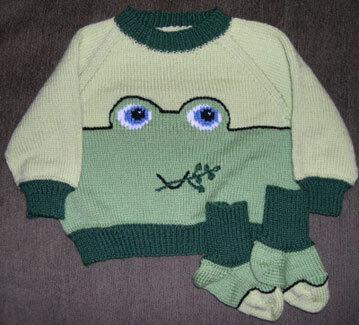 (See her blog for pics of the finished sweater!) 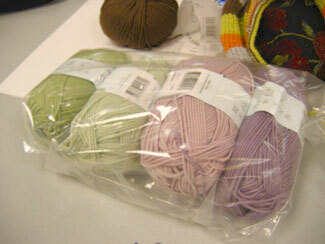 She's planning another in girly colors of Debbie Bliss Baby Cashmerino. So pretty! 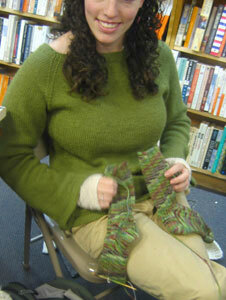 Dani finished a sweater from Knitting Nature. Can you tell how much she likes it? 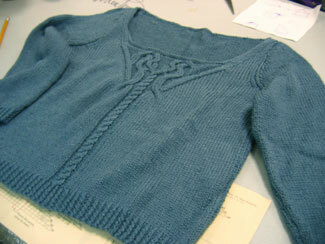 Here's a less blurry shot, so you can see the beautiful detail on the front. 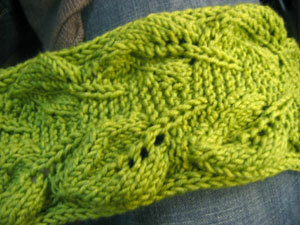 She used Berroco SoftTwist and it knit up so nice. 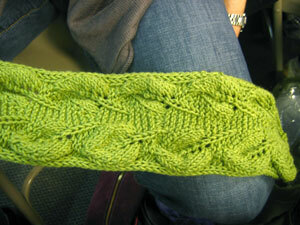 Oh yes, Dani's Fiddlesticks shawl project has her performing amazing knitting feats. 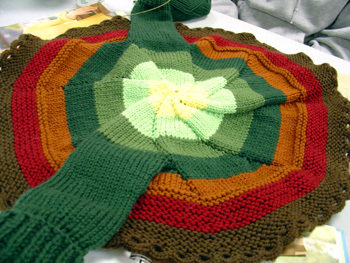 Dani is halfway done with the Backyard Leaves scarf from Scarf Style. Look at those beautiful leaves! 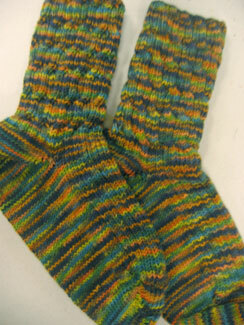 Dani's almost finished socks in her own hand-dyed "Amazon" yarn. 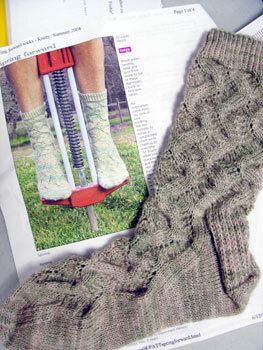 Don't the socks look great with her Hourglass sweater and wrist warmers?! 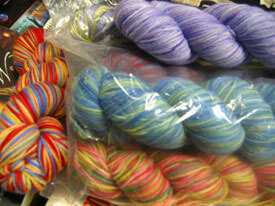 This week Dani brought in a bag full of her incredible handpainted yarns. 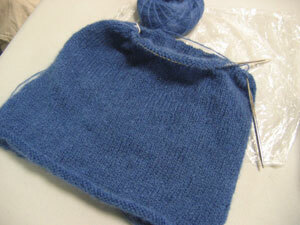 Dani is working on Jo Sharp's mohair singlet in a beautiful blue. 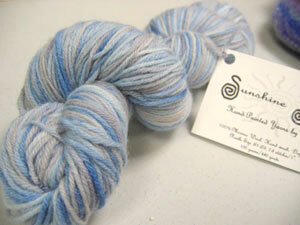 And speaking of beautiful blues, here's some of Dani's own hand-painted yarn that fellow Knitsmith, Susan, just bought. 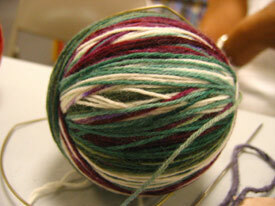 More fabulous hand-dyed sock yarn from Dani. 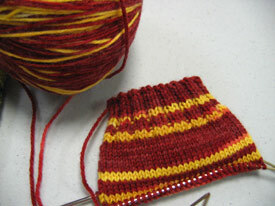 That's her new grapevine colorway and my favorite, the long-awaited and already very popular, Gryffindor colorway. 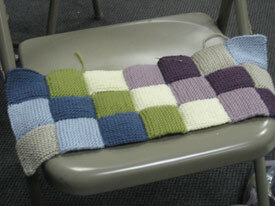 She also brought in this beautiful baby blanket that she's making. 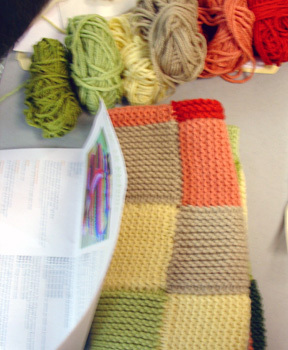 All those squares to sew together! Amazing. 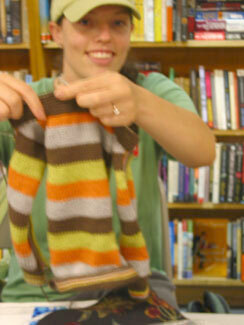 Dani (of the now famous hand-dyed tiger and watermelon sock yarns) brought in her current sock project. 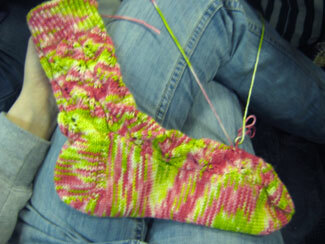 It's the gorgeous Go with the Flow socks from Interweave Knits Summer 2005.